There are a number of ways we could approach it, and it really depends on your goals. Think of the individual movements as being tools on the tactical level — they’re the maneuvers we use to carry out our plan, but the plan itself — in this case our training protocol — is decided at the strategic level. Many of you posted your ideas about possible training protocols in the comments of Part Six, and each of your solutions made sense given the strategic questions you were trying to solve. If you really want to understand these Bodyweight Glide movements and how they can be applied with totally different results in terms of your conditioning, I would encourage you to make an experiment of it. Take each of those suggested protocols and run them through a 28-day training cycle. Keep careful notes, and let us know what you discover. I could just spell out some of the differences here of course, but that would rob you of the experience of figuring it out for yourself. For the purposes of this series, I’m going to suggest one protocol for readers who would like to put this program to immediate use. Our hypothetical client in this case is someone who travels frequently for business, who has no access to equipment, little free time, and whose primary goal is to develop core strength through all degrees of freedom while increasing their cardiovascular capacity and losing excess weight. Perform each exercise for 30-seconds. When those 30 seconds are up, switch seamlessly into the next exercise and perform it for 30 seconds (don’t take breaks in between — that’s too easy!). Continue until you’ve done all 6 movements. That’s one circuit. The full program consists of 3 circuits, with 1 minute rest between each circuit. At first you’ll feel like you want to coast through the movements, to spread out your reps. Don’t do it. Your strategy should be to keep the fastest pace that you can manage while maintaining good technique. You want this to be intense. What’s the point of coasting along when you can squeeze every ounce from the time you’re spending? OR increase the duration of the exercises. Start by decreasing the one minute rest between sets. Ease that down to 30 seconds of rest, then to 15 seconds of rest. Your body will adapt by training itself to recover in less and less time. Next, increase the duration that you perform each movement to 40 seconds (from our baseline of 30). Finally, if you’re up for it you can remove the rest periods entirely so that you’re performing 3 back-to-back circuits nonstop. This has the added benefit of bringing your total workout time down to 9 minutes—allowing you to knock off early, or to add a fourth set. You can do this CST Bodyweight Glide program 3 to 4 times per week, or on the Moderate day of a 4×7 cycle. So that’s it. How to shred your core in 12-minutes per day, in a balanced, health-first fashion. We’re glad you chose to come along for the ride. Ok we beat you to the punch in South Florida. Every one of my clients (even the 60+ gals) did this circuit last week and OMG chests were heaving by the time we got to the tadpoles! I only made them do one circuit because I was afraid they would mutiny and decapitate me if I suggested another….but truly the flow was beautiful–much prettier than their grunts 🙂 Thanks! Thanks! This is perfect, and makes an easy addition to the Medium day in my current cycle. The timing is also good, since I’m heading out of the country for a bit, good to have this in my back pocket, along with Stage Crazy and FlowFit. Excellent! I’m trying it tomorrow, and can’t wait to suggest it to my bloggers and bloggettes! Great way to pull the series together! I have already started to wear through my felt pads. The tadpole still kills me, but I am working all 6 exercises. This combination of movements is helping my FlowFit practice, especially my leg swoops. I can’t wait to see what you come up with next. Maybe a lower body routine?? .-= Richard´s last blog -> Branched Chain Amino Acids & Why you need’em! =-. Wow, that hurt!! I am motivated to break through the pain and see improvement though. I started with 15 seconds or so per exercise before collapsing and then rolling into all six with varied success. It did feel awesome when I was done the three sets albeit kind of drained. So here is to an improved ‘next time’. Thanks so much for such generous sharing and world class imaginative exercises, holistic and therapeutic! I plan to vary the stage crazy, flowfit and the glide for some great training sessions. I was just wondering if you could give me descriptions on hot do do those exercises. I have only heard of one of them. Thank you for you generosity. Jenni – look back through the blog, the other six installments in this article series are there. I posted videos for every exercise. Thanks for the six routines. Will include in my daily routine. Tried all of them and found the second and fifth the most challenging. Noticed that with the fifth, even though you were on a smooth floor, a piece of felt or carpeting was used. Any reason as to why it was required only for this? 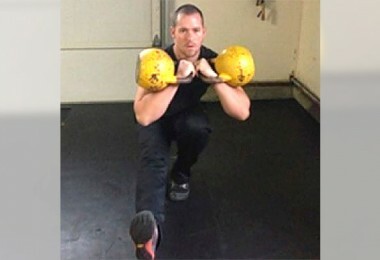 Most people have trouble with one or two of the movements. In my experience everyone’s weak in one or two of the 6 degrees. Slicing it down like this is a great way to uncover your weaknesses. >Noticed that with the fifth, even though you were on a smooth floor, >a piece of felt or carpeting was used. Any reason as to why it was >required only for this? The edges of my shoes were catching in the mats on that one (because i was moving along the knife edge of the foot). The felt pads made for a smoother slide. Thank you very much Coach Murdock. Your educational material is excellent and unselfish – love and peace. This all sounds very exciting, problem is I can see any of the videos. I just have a white box with a little symbol in top corner? any suggestions from anyone? hope so . . . . . . I already do a few disc abs using frisbees, sounds similar to yours. The tadpole sounds intriguing. Looking forward to putting this all together. Thanks Ryan. Actually, forgot to ask, do you have the complete circut posted in a video somewhere? Margie – the exercises are all posted here on the blog, but they’re in individual video segments, filmed when I was in Germany a couple months ago. I haven’t had time to do another video which puts them all together in the same clip. I may try to do that down the road, but at the moment simply too overworked with two professions (and a new commitment to a big 3rd endeavour). I am a fitness instructor and I cannot wait to put this to use. I have one group that will thank me (after they catch their breath) and one group that will curse me, especially the next day. I can’t wait! this looks great.